The image of a ten-year-old holding a toy machine gun always disturbed me; it gives me a bad feeling of the ultimate horror - something that even Hollywood has avoided pictures like that. Kids have been used and abused all through history. I still remember the shock I felt in the mining museum in York, England, when I saw the photos of little kids working tens of meters underground and how expendable their life was considered, but somehow there was a limit to how the kids were used. War was never for kids and many people were shocked when they found out that the average age of the soldiers who fought in the Vietnam War was 18. Suddenly, over the last few years, it seems that war has escaped from adult hands and landed machine guns in the hands of ten, eleven, twelve and thirteen-year-olds. The list of countries and groups that have used under-age soldiers is increasing daily, at the same time we are all shouting that 30,000 kids die every day from disease and a lack of food and water. Sri Lanka was the latest incident. 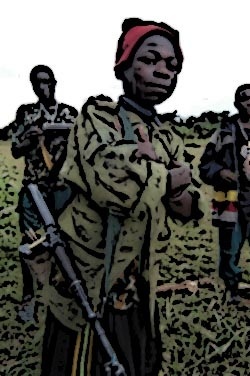 The government and the Tamil Tiger rebels are both employing under-age soldiers to fight their war. I will never accept that a ten or twelve-year-old is aware of their actions. A ten or a twelve-year-old is not just under-age, they are a child. A child that has just learnt how to walk alone. I cannot imagine the criminal mind behind these actions and I mean both, the state and the rebels. Who do they dare claim that they are trying to build a better world if they are destroying their only hope, their future, the children. Both sides deny the allegations coming from the UN, but furthermore they both promised full investigations and hold special committees that will investigate the allegations. Back in '80s there was a fantastic British comedy series called Yes, Minister and I will always remember a quote from the Ministry’s secretary when he was asked how they can cover up something the minister did, the answer was: "We will hold a special committee that will investigate." Firstly, they have to select the members of this committee, and then they have to find a place where this committee will meet. That has to be followed with all the legal procedures on how the committee will work and how much power it has and, after three years, it will end up without any meeting and be meaningless. That’s it! Hundreds of children learn that the only way to survive is to have a machine gun under your pillow. They will learn that only the strong and the one who is better armed will survive. What will happen when peace comes, if it comes? Will these kids return to schools, study and become members of a society where even the weakest have a say and an opinion? There are times I enjoy writing, other times I find it challenging, but when I have to write something like this it is sad and painful. I just cannot imagine how far we have gone as a civilization and how backwards we are as humans to use children for wars, especially using the excuse, "It's for a better future!" That’s just disgusting.